Most of you might already know how much I love to make cake in pressure cooker. I recently tried this whole wheat flour muffins in pressure cooker. This had been in my drafts for a very long time. Since this will be a lengthy post, I was postponing it. Now, I have a reason to sit and write this post which is revealed in the third paragraph. If you are new to baking in pressure cooker, I strongly recommend you to learn how to make a cake in pressure cooker for step by step detailed instructions. Be it a simple idli dosa batter or chapthi, not everyone succeeds in the first attempt. It might take even 3-4 attempts to learn the tricks of making a perfect dish. The same is applicable for making a cake in pressure cooker too. You might not be able to bake a perfect cake in pressure cooker in your first attempt. But I assure you that you can start making perfect cakes in pressure cooker in few attempts. 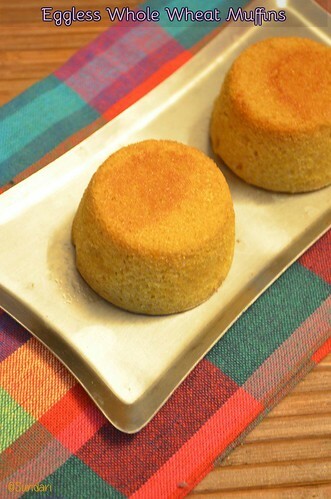 A lot of friends and readers have already tried my Eggless rava cake cake recipe in pressure cooker. You can check their comments in that post. 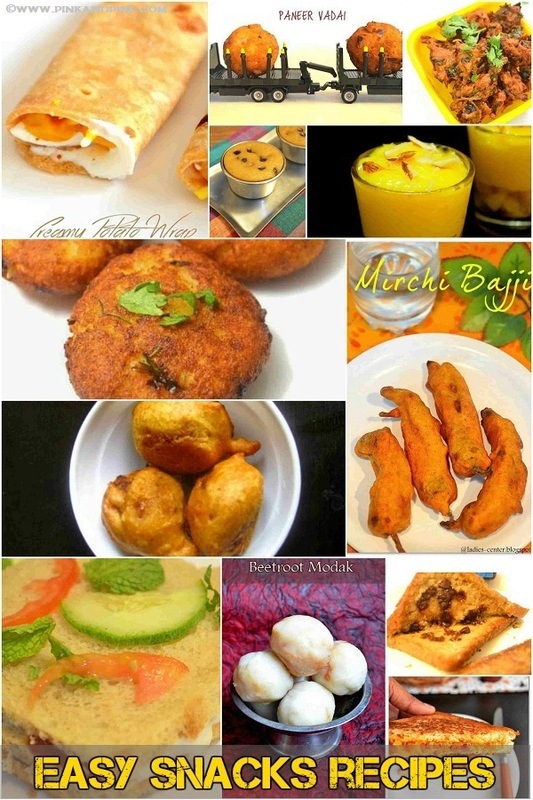 I am adding this post in my Healthy After school snacks ideas for kids. It is my 15th recipe in that series. First of all I would like to thank you for sharing the egg less cake recipe that can be prepared in cooker. I am generally not a cake lover but I had the Iyengar's bakery's egg less Rava cake while I travelled to Mumbai for a day. So after returning to Delhi I really wanted to have it again and I started looking for recipes online when I came across your blog which had very easy way of cooking this cake with tips and answers to simple but important questions. I tried it finally and here are few pictures I am attaching. The texture was bit brittle which is expected but looks like i have added more ghee than required. Next time I can improvise that. Taste wise it was great and quite similar to the one I had in Mumbai. The brown color chunks are chocolate pieces which I had added before baking and because of that cake was stuck at the bottom(lil bit). Overall it was an easy recipe and my family members are going to love it.. There is no wonder that desserts can make a normal day into a special occasion. Do I need to mention that cake is the most special dessert. 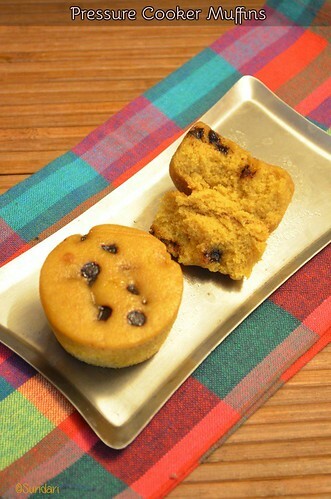 I tried this whole wheat flour jaggery muffin for the following 2 reasons. I do not like to add maida to the cake. There are many other flour options. But I chose Whole wheat flour as it is the basic one that is easily accessible for everyone. I do not like to add sugar to the cake. I thought Jaggery will be one of the good natural sweeteners to replace sugar. Jaggery goes very well with whole wheat flour than normal maida. Both of them make the cake an unhealthy dessert that anyone can serve to the family. Before moving to the recipe, let me tell you about the texture of the cake. You can see the texture of the muffin in the below photo. Can I expect anything more from a whole wheat muffin baked in pressure cooker? 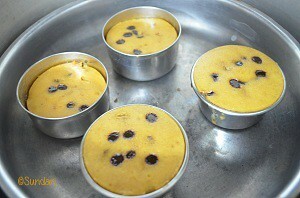 Learn how to make a cake in pressure cooker. Try this whole wheat flour muffins in pressure cooker. 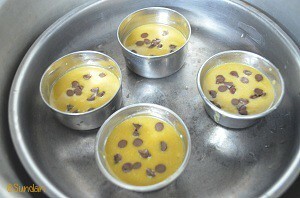 This is a healthy dessert that can be served for even kids. Chocolate chips - 2 tbsp or as required or tutti-frutti(optional). Take all the ingredients in a mixing bowl except vanilla essence, water, oil and milk. Mix well. Add vanilla essence, 3/5 tbsp water and oil and whisk well If required, add another 1/4 tbsp of water. Whisk everything well without lumps. 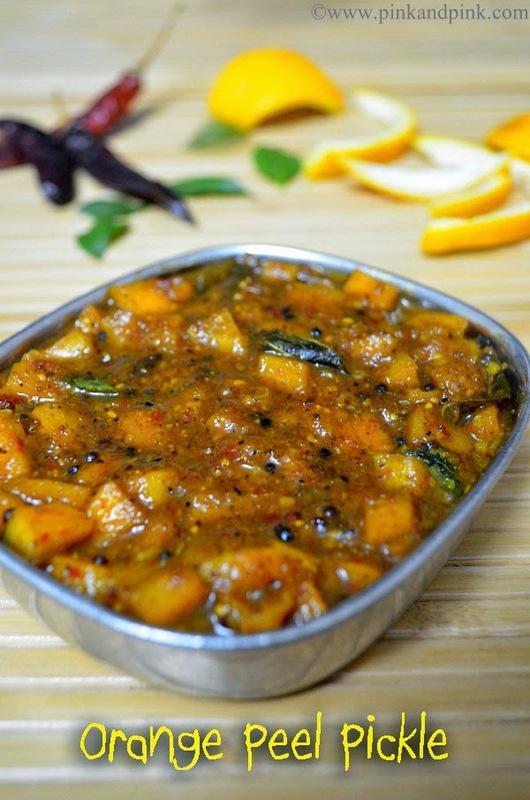 Take small stainless steel bowls and grease them well with ghee or butter. If you have aluminium or stainless steel cupcake moulds, you can use them. I do not have them. Hence, I have used small stainless steel bowls. Pour the whole wheat flour cake batter inside all the cupcake moulds till 3/4 size of the moulds and spread some chocolate chips on top. You can even add Tutti Frutti. You can omit them if you do not have. Place the moulds in a thick plate or in a pan in which we use in a a pressure cooker. 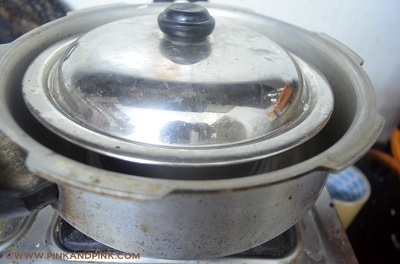 You can use a plate similar to the one in the picture below or you can use the pan which we put rice in the cooker. We should be able to conveniently close them with a lid. The picture is in the next section. Preheat the pressure cooker without the gasket and without a whistle and with its lid on for 5 minutes in medium flame. If you are new to baking in a pressure cooker, I strongly recommend you to check my rava cake recipe which has detailed instructions on how to make cake in pressure cooker. Open the lid carefully and keep it aside. Place a perforated plate on top of the cooker. Place the plate that has cupcake moulds. Close it with a thick steel lid as mentioned in the picture. The picture is in the next section. Bake for 25-30 minutes till the cupcake raises in medium flame. It took 25 minutes for me. Check notes for detailed instructions. 1. Take all the ingredients in a mixing bowl except vanilla essence, water, oil and milk. Mix well. 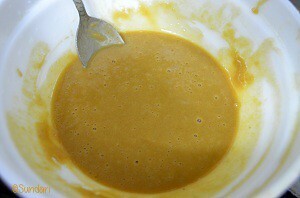 Add vanilla essence, 3/5 tbsp water and oil and whisk well If required, add another 1/4 tbsp of water. Whisk everything well without lumps. 2. 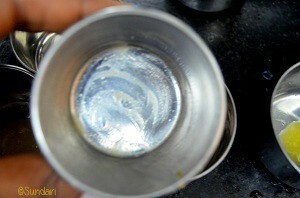 Take small stainless steel bowls and grease them well with ghee or butter. If you have aluminium or stainless steel cupcake moulds, you can use them. I do not have them. Hence, I have used small stainless steel bowls. 3. Pour the whole wheat flour cake batter inside all the cupcake moulds till 3/4 size of the moulds and spread some chocolate chips on top. You can even add Tutti Frutti. You can omit them if you do not have. Place the moulds in a thick plate or in a pan in which we use in a pressure cooker. 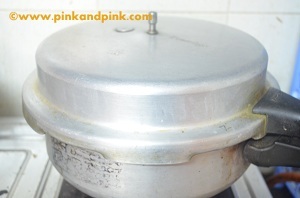 You can use a plate similar to the one in the picture below or you can use the pan which we put rice in the cooker. We should be able to conveniently close them with a lid. The picture is in the next section. 4. Preheat the pressure cooker without the gasket and without a whistle and with its lid on for 5 minutes in medium flame. If you are new to baking in a pressure cooker, I strongly recommend you to check my rava cake recipe which has detailed instructions on how to make cake in pressure cooker. 5. Open the lid carefully and keep it aside. Place a perforated plate on top of the cooker. 6. 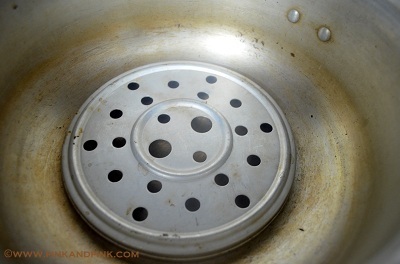 Place the plate that has muffin moulds inside the cooker on top of the perforated plate. Close it with a thick steel lid as mentioned in the picture. The picture is in the next section. 7. Bake for 25-30 minutes till the cupcake raises in medium flame. It took 25 minutes for me. Check notes for detailed instructions. Space will be formed between the muffin and the sides of the mould. If you bake the muffin right, it will be non-sticky. 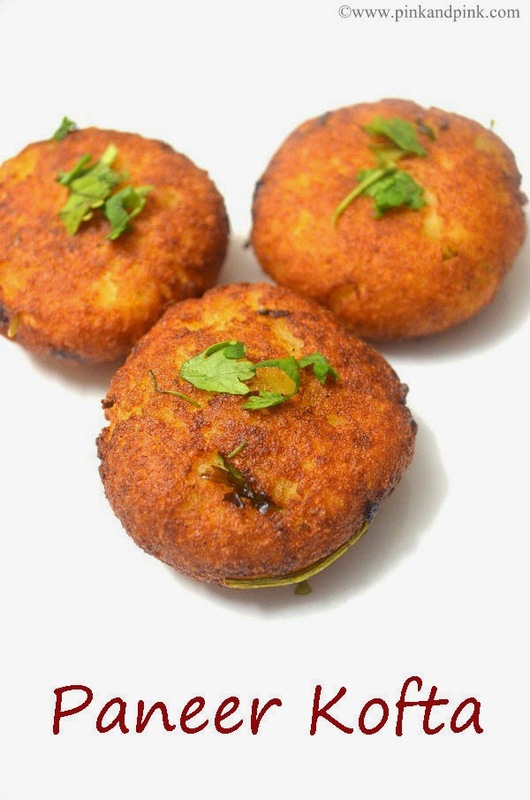 Insert a toothpick or a knife greased with ghee or oil into the cake. It will come out clean. If the cake is not baked properly, the flour will stick to it in a semi-solid form. If you overcook the muffins, the top will turn flat and bottom will start burning. 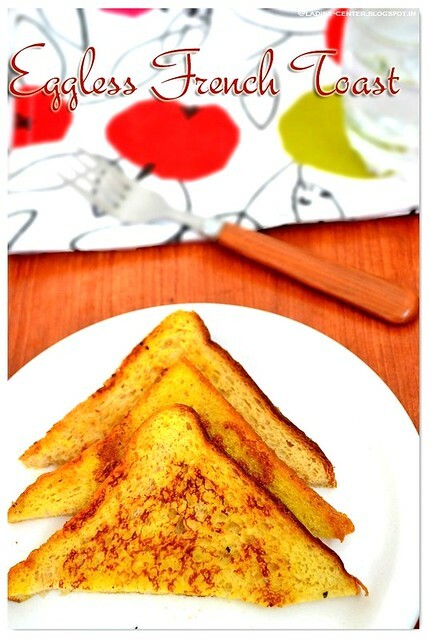 The above are the basic points to check whether the muffin is baked. If you run the knife around the muffin, you will be able to separate it from the bowl by inverting it. You might need to shake a little bit. 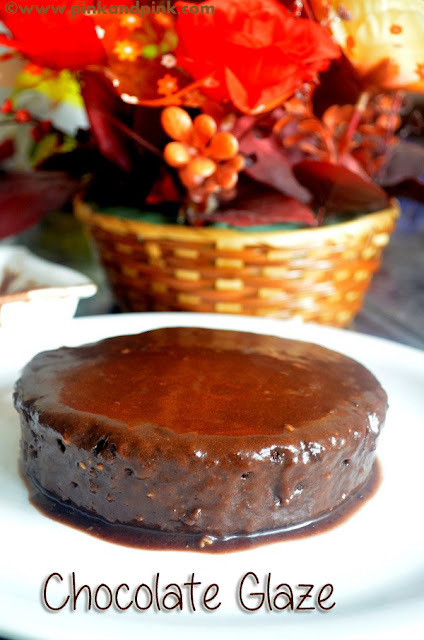 Here are some more interesting cake recipes in pressure cooker. For more pressure cooker cake recipes, pressure cooker brownie recipes, pressure cooker pizza recipes, check this post -Pressure cooker cake recipes. Share this post with your friends and family who do not have oven to bake a cake. Let them also enjoy making cake in pressure cooker. Thanks for the recipe. Surely will try this. Loved it. The cake looks quite spongy.